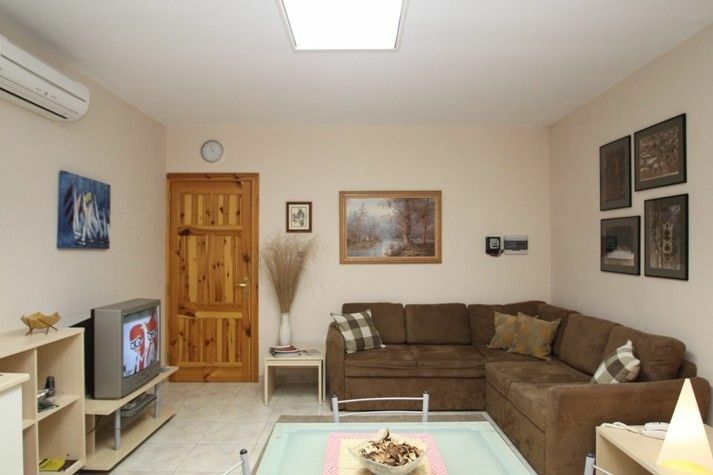 Bugibba, St Pauls Bay :Modern & Air-coned Apt x 3 bedrooms Close to the sea. Modern, bright and spacious and air-conditioned apartment in Bugibba. The apartment is tastefully furnished with modern furniture, is served with lift and enjoys a lot of natural light. Modern self catering APARTMENT close to the sea front in this popular tourists area. This holiday apartment is served with lift and consists of entrance hall, an open plan kitchen/living room with air condition, cable TV and DVD player, 3 air conditioned bedrooms,, bathroom, spare shower and balcony. The apartment is tastefully furnished with modern furniture, is served with lift and enjoys a lot of natural light. It is situated in a quiet area yet close to all amenities, entertainment area and promenade. Bugibba is located on the North East coast of Malta and one of the 2 popular tourist areas of St Paul's Bay. Bugibba, is the largest resort in the area, with good views of St Paul’s Bay and its islands. Proving its popularity, Bugibba has the liveliest night-life, a cinema, bingo hall and even a casino. Bugibba is a hive of activity after dark with a many bars, wine bars, clubs and discos to cater for the young and those young at heart. There are also a wide variety of restaurants to suit all taste buds and also all pockets. The main day time and night time entertainment center is Bugibba Square where one finds cafeterias as well as restaurants and other shops. The monthly rate is valid for up to 4 persons sharing . It does not include water and electricity consumption. Weekly prices are valid for up to 4 persons sharing. Please add 15 euros for each additional persons per night. bathroom 1: bath, wash hand basin, toilet, shower. Bathroom 2 : wash hand basin, toilet, shower. A lovely space, air conditioned, very helpful host, and fantastic location! Lovely, spacious and clean apartment. The aircon was a godsend as we were lucky enough to have baking temperatures during our stay. The apartment is very close to Bay Square; the front at Bugibba; many restaurants and bars and the bus stop. For eating, I would recommend Sans Souci (just around the corner), Peking Chinese restaurant in Tourist Street and best of all - the Sunday roasts at the Red Lion Qawra - just over the road from Bugibba Bus Terminus. The buses are very cheap - 2 euros + 60 cents for a day return anywhere on the island - best places we visited: Ta 'Qali Craft Village; Mdina; Valletta & Gozo. Thank you for a great stay in your apartment and for making us feel so welcome, Rita! the property was beautifully clean with spacious bedrooms and two bathrooms, there was a lift which was great as we were travelling with a small child. Rita the owner greeted us when we arrived and gave us instructions on how the air conditioning worked and where everything was. The property was nicely furnished and there was plenty of towels and bed linen. The area had lots of small shops with plenty of places to eat and drink just a short stroll from the apartment. There was a pharmacy with a doctor just around the corner from the apartmant which gave us peace of mind travelling with a child. The buses ran all the time making it ideal as once you reached the property there was no need for a car, a short bus ride away was a lovely sandy beach ideal for children and adults alike wanting to swim and sunbathe. I would not hesitate to reccomend this apartment to all my frinds and family. I would rate this property at 5 stars. We had a great stay at the Bugibba apartment. The apartment was clean and spacious. With a family of 5 it was practical to have 2 bathrooms. The garage was nearby and very useful (since we rented a car that only had 10 000 kilometers on the meter). We liked the fact that we could easily walk to the sea (about 200 meters) every evening, but still had an apartment in a quiet area. The apartment was further well-equipped, and Rita had taken care of bread, fruit juice etc, so that we did not have to look for a shop immediately. It was further very practical that she had booked a two-way transport between the airport and the apartment. She was friendly and correct. We would definitely recommend this place to friends and family. L'appartamento è perfetto, pulito e molto molto carino. A due passi da tutti i servizi. La gentilezza e la disponibilità della proprietaria, Sig.ra Rita, rende il tutto estremamente piacevole. Just returned yesterday from a fantastic week in Malta. This apartment was everything it said in the advert and more. Beautifully clean and well appointed it met all of our needs and the air conditioning and fans in every room meant it provided a cool haven when the weather was really hot. Rita could not have been more helpful and arranged our transfers to and from the airport. You definitely don't need a car - the apartment is only a few minutes walk from Bugibba Square and there is a good selection of bars and restaurants. The local buses are an experience not to miss and the blue hop on and off tour of the north of the island was fabulous with the added bonus of a free harbour cruise with the same ticket. (and if you have flown with Ryan Air your boarding pass gets you a 3 Euro discount). All in all a wonderful holiday and one we would certainly recommend.